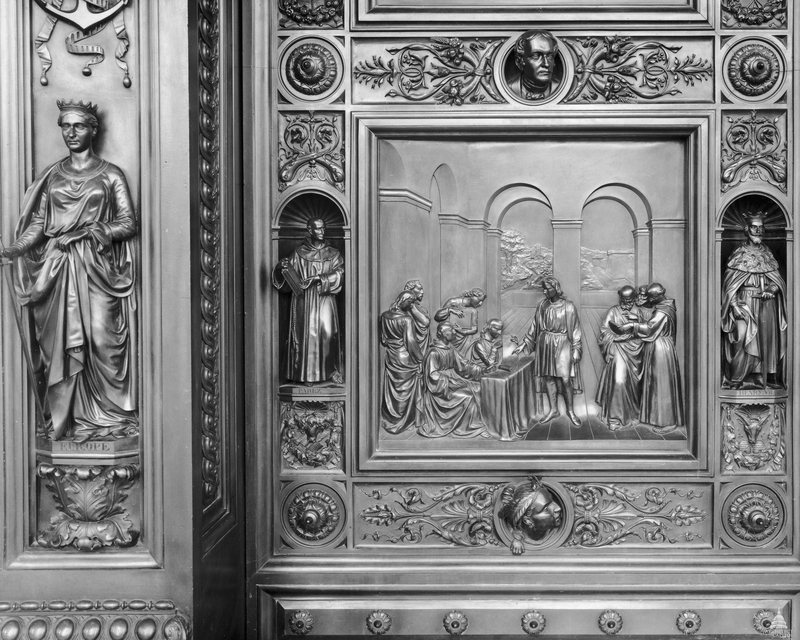 The Columbus Doors, also called the Rogers Doors or Rotunda Doors, stand imposingly at the main entrance to the U.S. Capitol Building, almost 17 feet high and weighing 20,000 pounds. 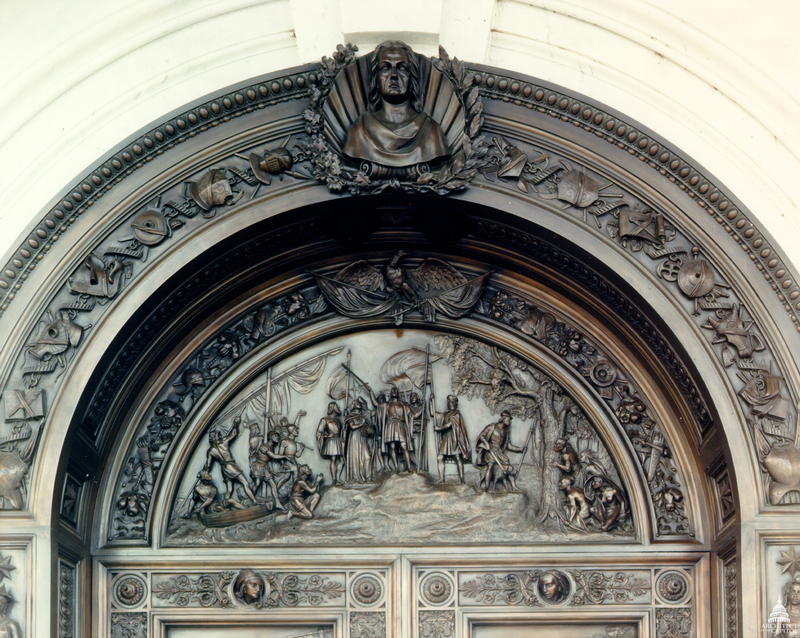 Designed by American sculptor Randolph Rogers, each scene depicting the life of Christopher Columbus is finely modeled. 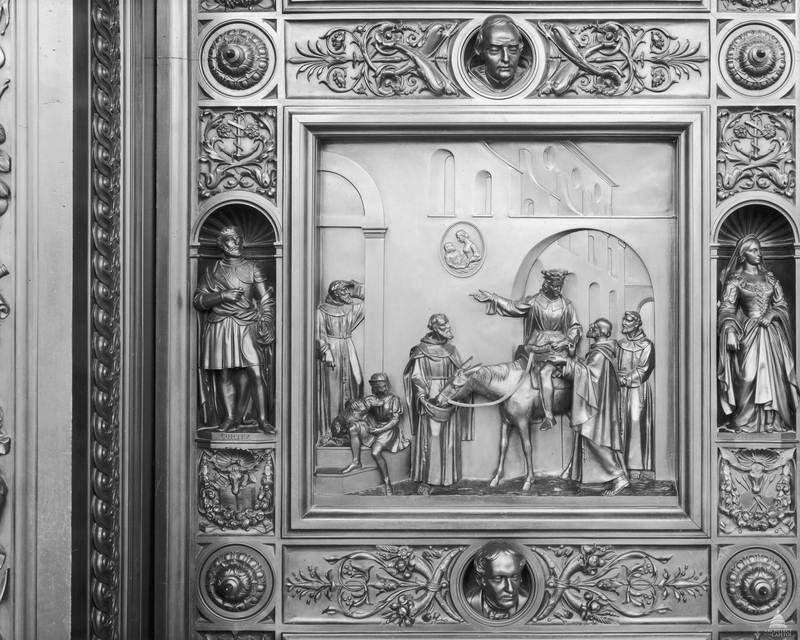 The doors were installed in 1863 and moved to their present location in 1961 following the extension of the East Front of the Capitol. 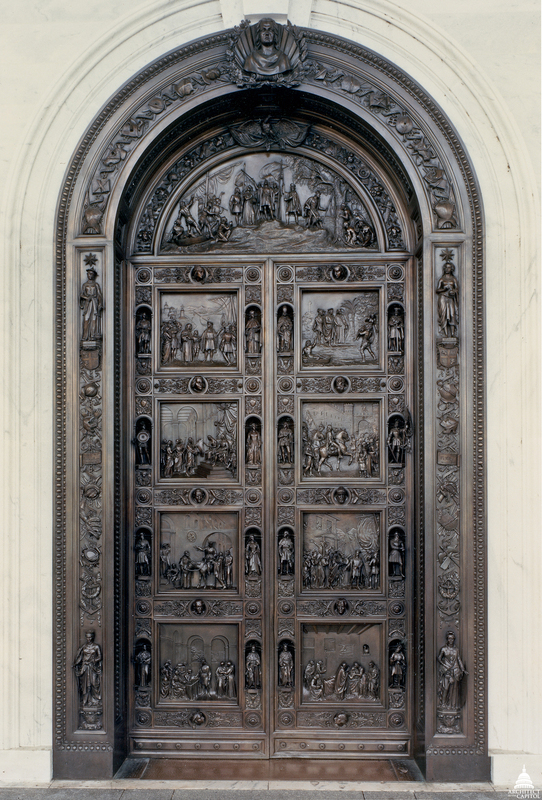 The bronze doors are curved, with a semicircular tympanum above two valves that are divided into four panels each. 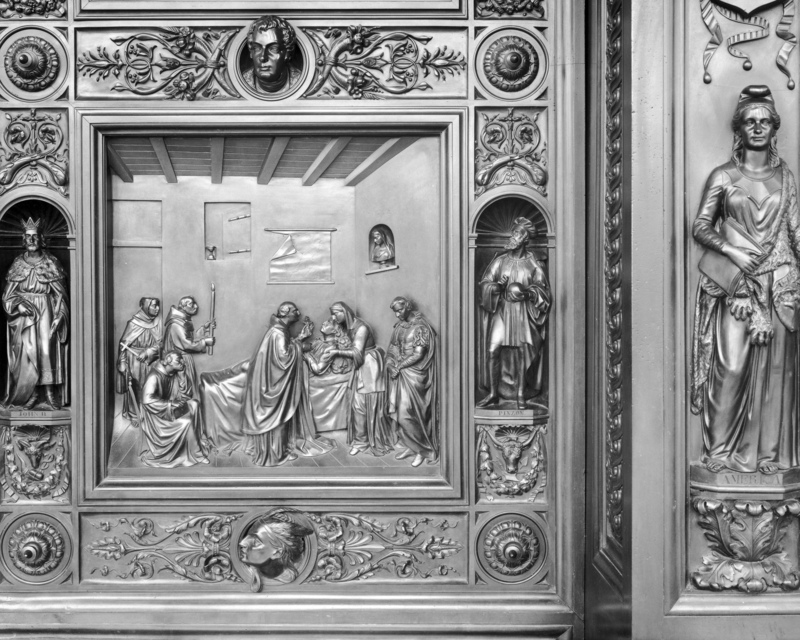 Techniques of Renaissance perspective and different levels of relief give each scene a sense of depth. At the pinnacle is a bust of Columbus, surrounded by rays and oak leaves, signifying his rising to glory. A running border is ornamented with Indian headdresses and emblems of conquest, navigation, the arts and sciences, history, agriculture, and commerce. The four figures symbolizing the continents of Asia, Africa, Europe, and America indicate the entire world's acknowledgement of Columbus's accomplishment. 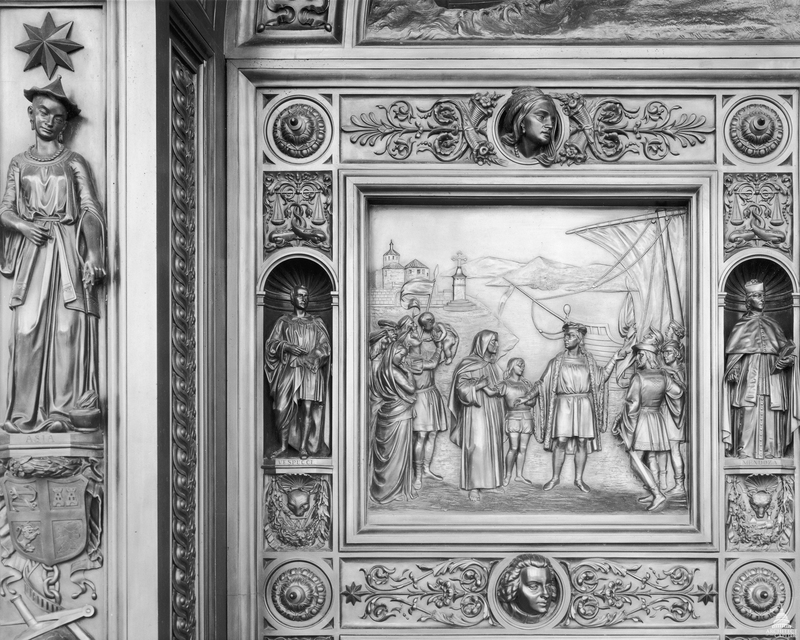 Between the panels are sculpted heads of historians and others whose writings on Columbus's voyage were the bases for the scenes depicted. The life of Columbus begins at the bottom of the left valve and continues in a clockwise progression, consisting of the following scenes. 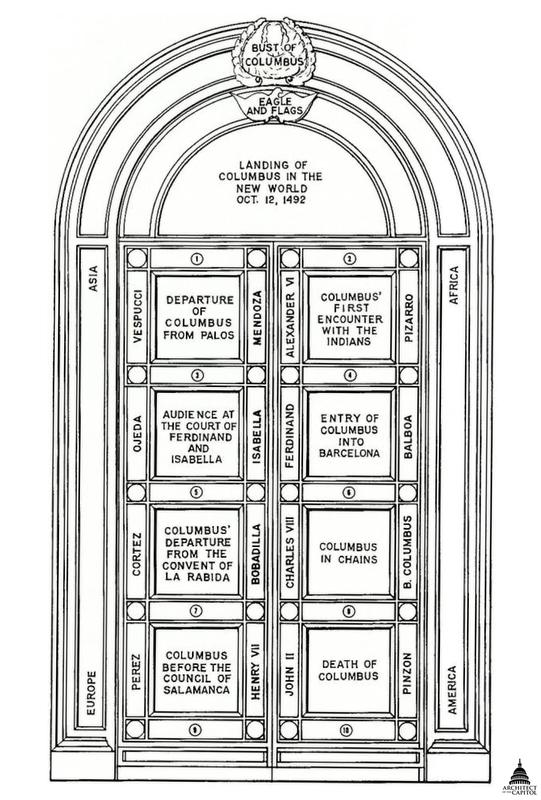 Columbus displays a chart in an unsuccessful endeavor to convince the Council appointed by King Ferdinand to support his theory of a new route to India. On either side of the panel are the statuettes of Juan Perez de Marchena (inscribed "Paraz"), prior of the Convent of La Rábida and friend of Columbus, and Henry VII of England, a patron of navigation, who agreed with Columbus's theory. Columbus, mounted on a mule, is prepared to depart from the gate of the convent run by friar Juan Perez, former confessor to Queen Isabella. While sheltering Columbus and his son, Perez was so impressed with Columbus's vision that he wrote to the Queen urging her to reconsider supporting the expedition. Statuettes of Hernán Cortés, the conqueror of Mexico, and the Lady Beatrix de Bobadilla, an attendant of Isabella who befriended Columbus, flank this panel. This panel depicts Queen Isabella listening attentively to Columbus's explanation of his map, with King Ferdinand at her side. On April 17, 1492, the agreement to finance the voyage was signed. Beside this panel are figures of Alonzo d'Ojeda, a Spanish adventurer who accompanied Columbus to the New World, and Queen Isabella. It was from Palos that the Niña, Pinta, and Santa Maria set sail on August 3, 1492. 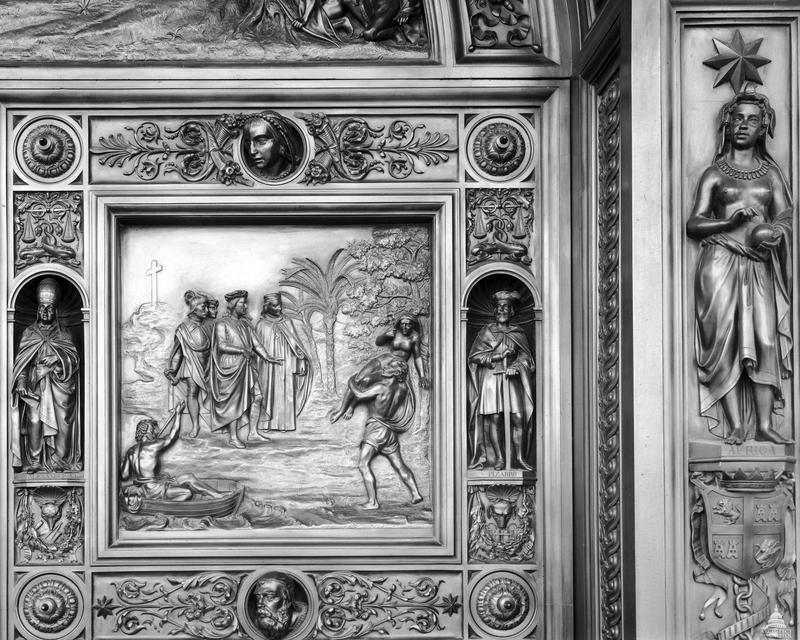 This scene depicts Columbus placing his son Diego in the monks' custody before his embarkation. The figures in the border are Columbus's friend Amerigo Vespucci and Pedro Gonzales de Mendoza, the Archbishop of Toledo and Grand Cardinal of Spain, who had great influence at Court. The large lunette shows Columbus claiming the island now known as San Salvador for Spain. Columbus, in the center of the composition, raises his sword and the royal standard; a cross is raised behind him. The central group of Columbus and his men is balanced by another group of Columbus's men in a small boat at the left and by the natives hiding behind the tree at the right. This panel depicts the Spaniards taking possession by erecting a cross on the island of Hispaniola. One of the sailors is carrying an Indian girl he has taken prisoner on his shoulders, as Columbus shows his disapproval. The panel is flanked by statuettes of Pope Alexander VI, who supported Spain's claim to the new land, and explorer Francisco Pizarro. 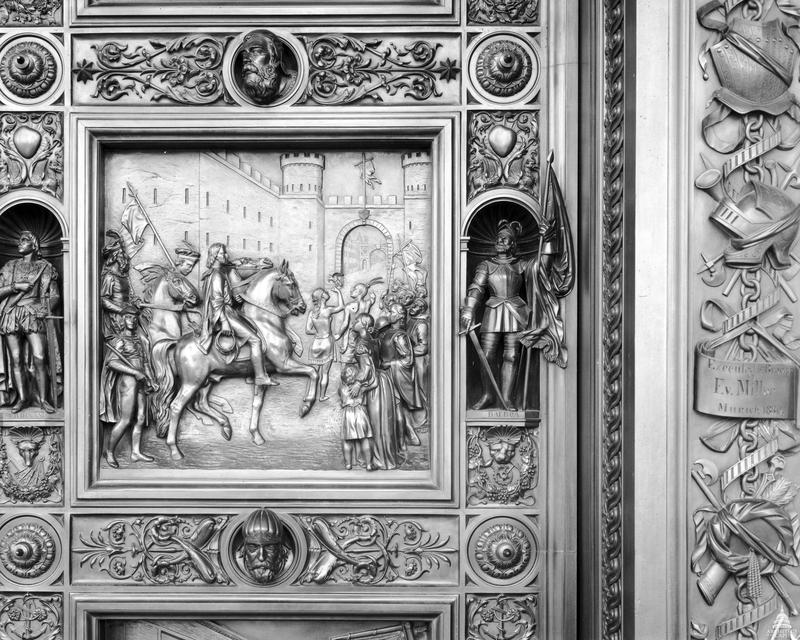 After his first voyage, Columbus makes a triumphal return on horseback through the gates of the city where the court is sitting. After his hero's welcome, he was granted the titles of admiral and viceroy and was given a coat of arms. The figures in the border are King Ferdinand and Vasco Núñez de Balboa, the Spanish discover of the Pacific Ocean. Columbus shows his chains to the crowd as he is about to go aboard the vessel that was to take him back to Spain after his third voyage. Don Francisco de Bobadilla, who was sent to replace Columbus and to investigate charges against him, is pointing to his instructions. After Columbus was cleared of the charges, he returned for the last time to the new world in 1502. Statuettes of King Charles VIII of France and Bartholomew Columbus, who was the explorer's brother and the lieutenant- governor of the Indies, are seen to the sides. After Queen Isabella's death in 1504, Columbus lost his influence at the court. As he lies on his deathbed, priests and friends are gathered around him, and one priest holds up a crucifix for him. Columbus died at Valladolid on May 20, 1506. 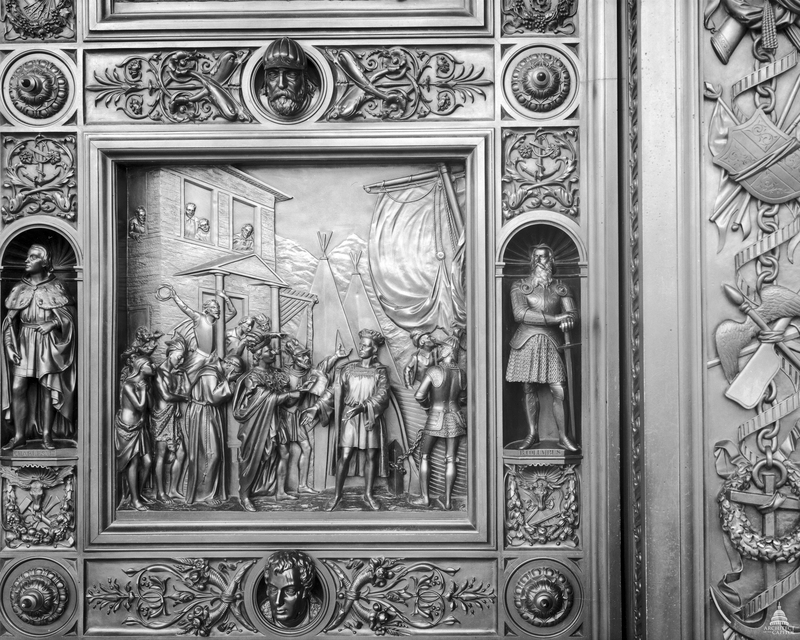 The figures on either side of the panel represent King John II of Portugal and Martín Alonzo Pinzón, the commander of the Pinta. 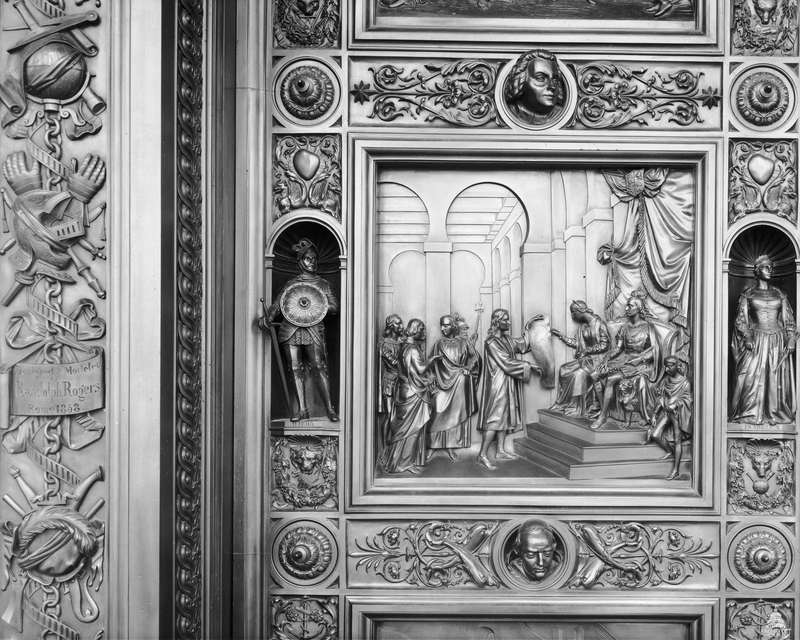 The American sculptor Randolph Rogers (1825-1892) was asked by Captain Montgomery C. Meigs, the Supervising Engineer of the Capitol Extensions, to design a set of doors for the entrance to the new House wing from Statuary Hall. As a subject, Rogers suggested the life of Columbus. Rogers's estimate for the project was approved on May 24, 1855, and the artist, who had earlier studied sculpture for three years in Italy, went to Rome to work on the models. The commission for the Capitol was only his second large public work. The model was completed in 1857 and was cast in 1860 by Ferdinand von Miller at one of the finest foundries in the world at the time, the Royal Bavarian Foundry in Munich, Germany. However, because of delays in transportation, the doors did not arrive in Washington to be installed until 1863. In 1871, they were moved to the central east front entrance. They were moved to their present location in 1961 following the extension of the East Front of the Capitol. The doors were most recently cleaned and conserved in 2008. Because of the heavy use of the entrance by visitors to the Capitol, areas of wear and damage must be repaired regularly.